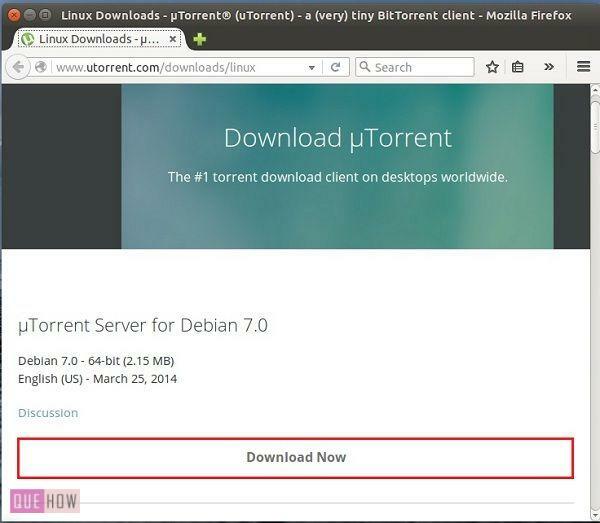 Do you want to know how to install utorrent server on Linux?. I guess you all are very well familiar with the use of torrent in your Windows system but what about Linux operating system. Don’t worry friends, those days are gone when utorrent is available for Windows only. Now, you can easily download and configure one of the best torrent download client on the desktop. Step 1: First go to the torrent website: www.utorrent.com/ and then click on “Download Now” button. Step 2: Now, click on “Save File” option, in order to install utserver.tar.gz. Step 3: Now open your terminal by using Ctrl+ALT+T and traverse to the downloaded folder where you’ve saved your utserver.tar.gz file. For that just type: “cd /home/ubuntu14/Downloads”. Step 4: Type: “sudo mv ut-server.tar.gz/opt/” to move your downloaded file to opt folder. Step 6: Now, to unzip your torrent archive file, just type: “sudo tar -xvf utserver.tar.gz” and hit enter. Step 7: Now, type “sudo chmod 777 -R utorrent-server-alpha-v3_3/” and then press enter. Type your root password when prompted. Step 9: You can launch utorrent by using: “sudo ln -s /opt/utorrent-server-v3_3/utserver/usr/bin/utserver”. Step 10: Finally you’ll need to perform one more step i.e., to install one missing library package. For that, type: “sudo apt-get install libssl0.9.8” and hit enter. This library will take care of all your torrent server glitches. Note: If you want to configure your utorrent server, then you can go to “http://localhost:8080/gui/”.